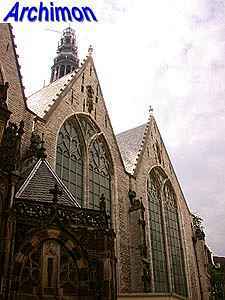 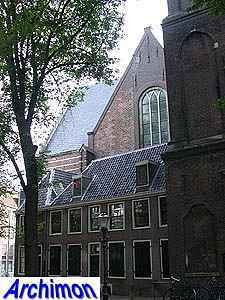 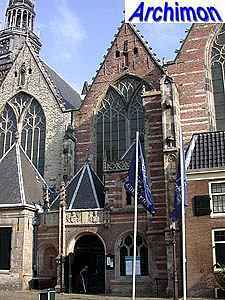 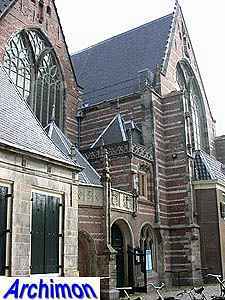 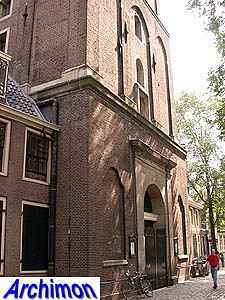 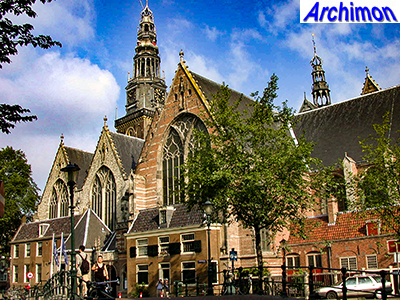 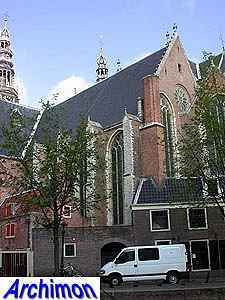 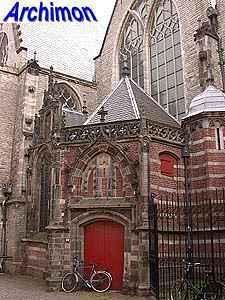 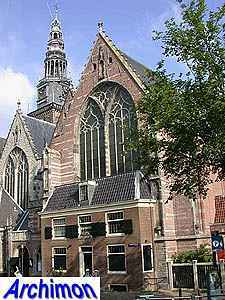 The Oude Kerk (Old Church) is Amsterdam's oldest building, with its oldest parts dating from the 13th century. 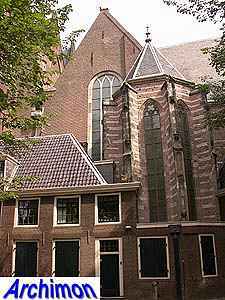 Until the protestant took over power, the church was consecrated to St. Nicholas of Myra, patron of sailors and traders and patron saint of Amsterdam. 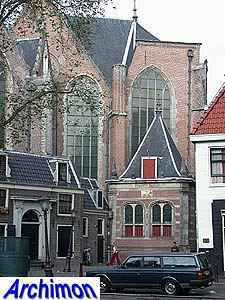 The church had had several predecessors before it was constructed. 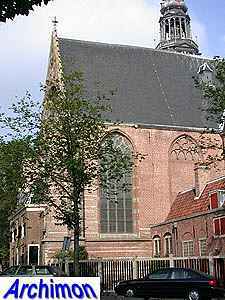 A wooden chapel was replaced by a stone hall church during the second half of the 13th century. 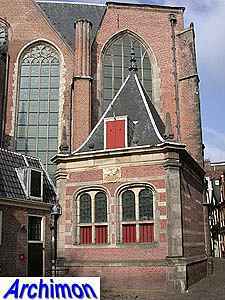 Since the church had to be build on piles which were driven into the muddy soil, the construction was made as light as possible. 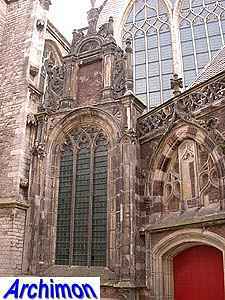 Therefore it has wooden barrel vaults and tall pointed windows, and covers a large area compared to its height. 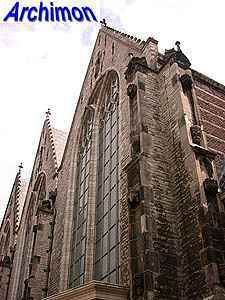 The current church however is also the result of numerous changes that were made to the building later. 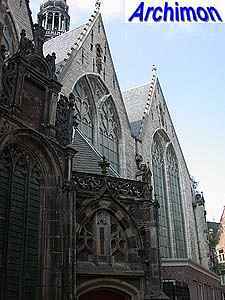 It was widened as well as heightened, but plans to heighten the transepts as well were never executed. 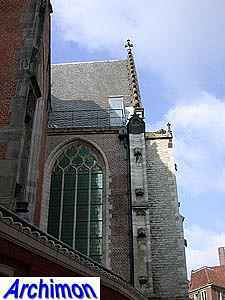 Until this very day the transepts still carry their provisional roofs. 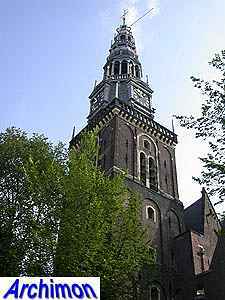 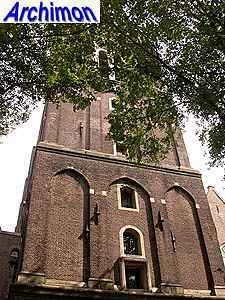 The tower received a new spire was in 1565, in a mixed Gothic-Renaissance style by Joost Jansz Bilhamer. 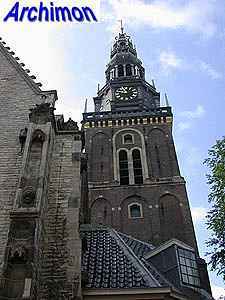 A new layer of stone in Renaissance style was added to the tower in 1740 to prevent it from leaning. 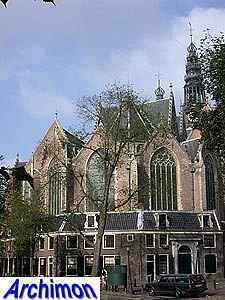 The church survived two great fires (in 1421 and 1452 respectively) but was severely damaged by the iconoclasm of 1566, when fanatical protestant vandals destroyed much of the interior. 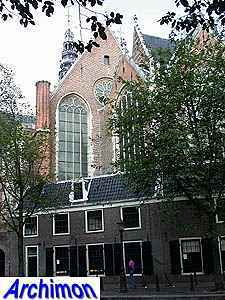 When Amsterdam in 1578 officially became a protestant city, the church was confiscated and adapted to the protestant needs. 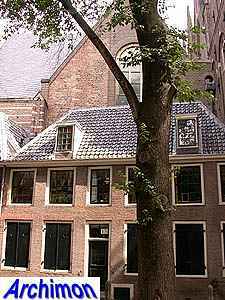 From 1584 until 1611 the building also served as a commodity exchange. 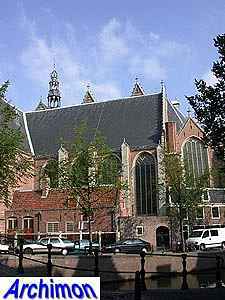 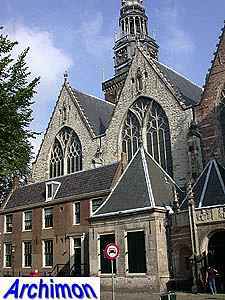 The position of the church declined altogether after the new town hall at the Dam had been finished, and the Nieuwe Kerk became the city's main church.